Peanut profile on August 7. Peanuts were planted on April 12, putting them at 117 days. A harvestable peanut typically needs at least 40-50 days of development after initiation to gain enough weight for yield. It has been common for the majority of the peanut crop to reach optimum maturity between the 140-150 days in recent years in Georgia. Therefore, a fertilized bloom or developing peg at the 100 day after planting point in the season should theoretically “make it into the basket”. Anything that initiates after that point is questionable unless the crop is pushed late for digging, which can then start to cause losses of the earliest formed pods either from deteriorating peg strength or germination of the seed in the hull if its funiculus has detached from the hull. Using Aug. 8 as a reference point, any peanut planted on April 30 or earlier will have reached the 100 day point, and will be at the critical point for increasing any additional pod set that could become harvestable. Essentially, the early planted crop is already set. 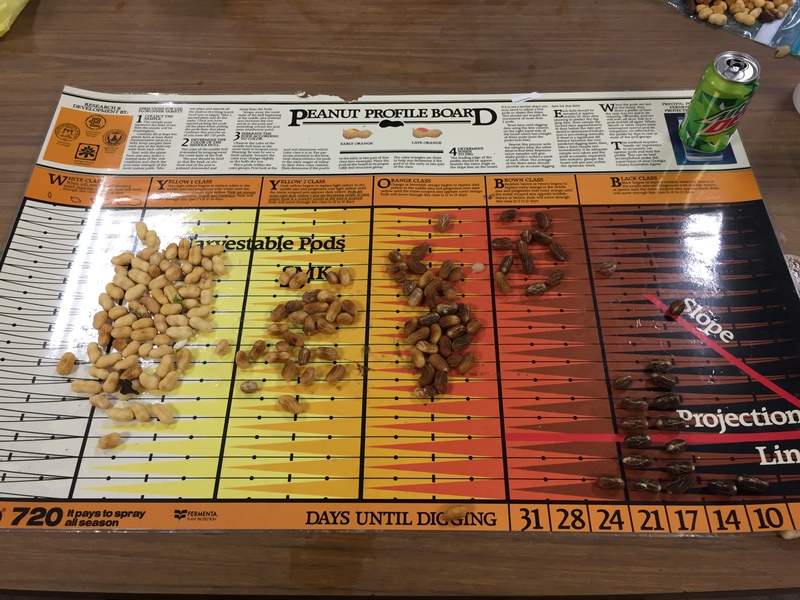 For peanuts planted in the month of May, there is roughly the equivalent number of days left to set additional pods in the crop as the date of planting in the month. For instance, if you planted on May 14, then you would have about 14 more days to set additional pods that could become harvestable by the end of the season. Everything beyond that 100 day old point becomes a matter of maintaining the maximum yield potential by filling the pods that have already established. Weather conditions in central Georgia show favorable chances for continued rain, which is overall good for the crop. However, it can cause delays in timeliness of applications for weeds, insects, and diseases issues. At least for the next few weeks, take advantage of good operating conditions in the field when you have them to get herbicide, fungicide, and insecticide applications out. However, if your crop has been challenged up to this point in the season, the good news is that there is still time to make up for it and produce harvestable pods if you planted in the month of May. Watch maturity profiles closely, especially when you get past 120 days , and don’t be afraid to push those peanuts later (beyond 145 days) if the maturity profile calls for it and the overall vegetative conditions (vines, leaves, and pegs) are relatively healthy.